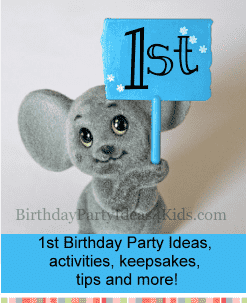 Fun 1st birthday party ideas for girls and boys. We've collected our favorite party ideas for the first birthday on one page to make it easy to find ideas that will work with your party, theme and budget. Great 1st birthday party ideas for girls and boys on a budget! Announcing the special day with birthday invitations is a great way to let family and friends know about the very important 1st birthday! A first birthday invitation will not only serve as a reminder that the birthday is approaching, but will also be a keepsake for family and friends after the party is over. Make a fun personal first birthday banner using pictures of the birthday boy or girl. Print out black and white photos of just the face of the birthday child - about 5 inches high. Use about 7 - 10 different photos. Then cut out party hat triangles from colorful scrapbook paper that matches the theme of the party and give each photo a party hat. Place a pompom ball on the tip of each party hat. Glue the photos on a long string and use as a banner across the party table or fireplace. This is also a fun idea to do for cupcake toppers. Print out smaller one year old photos of the one year olds face - about 1.5 - 2" high and glue on party hats. Glue a toothpick to the back and place in cupcakes. Try to plan the first birthday party for just after nap time so your child will be awake and happy. If this isn't possible then try and have the party as early in the day as you can. The length of the party should be between 1 and 1 1/2 hours. Make two cakes - one large cake for guests and one small cake for the one year old to smash. The smaller cake, or "smash cake" can be a mini replica of the larger birthday cake. Plan to do as much of the party decorations, food preparation, activity and game set up the day before the party. Trying to do it all the day of the party is stressful and makes everyone cranky. Plan a few things or activities that guests can help you with during the party. Planning ahead for the "what can I do to help?" question will ease your day and make things run smoothly. Fill a photo album with pictures of the first year. Fill a photo album with pictures of your child's first year. On the margins around the pictures ask party guests, family and friends to write special thoughts, memories or wishes to the birthday child. Create one or two scrapbook pages for the first birthday celebration. Leave blank spots for the party pictures so you can insert them after the party. Set the pages out on a table with plenty of pens and markers. Ask guests, family members and friends to fill the pages with handwritten messages and well wishes for the one year old. Insert the pictures from the party and add any special embellishments you choose. Create a special time capsule of the first birthday that your child can open at their 16th or 18th birthday. Fill a sturdy box with pictures from the party, receipts, pictures of your house, a favorite toy, birthday invitation, handprints, birthday candle, decoration, etc. Set out note cards and ask guests to write a special note for the time capsule. Include out of town relatives by asking them to send a special first birthday note and including it in the box. Then seal up the capsule and write or attach tags with two dates - the date of the first birthday party and the date 15 years (or 17 years if you want them to open the capsule on their 18th birthday) from the first tag. Place it somewhere safe and then when the years have passed you will have a wonderful surprise for your child and something they will treasure forever. Make a shirt with a large #1 on the front. This is great for photos! You can draw this on a shirt with a permanent marker or find an iron on transfer. Many craft stores sell iron on transfer paper that allow you to print out a transfer directly from your printer. Buy large foam #1 fingers for guests to take home as a party favor. They'll always remember who's Number One! #1 Piñata - You don't have to break it open ... they just look great in pictures! Tie helium balloons to the high chair to create a backdrop for pictures. Drape a colorful vinyl tablecloth over the high chair to create a colorful sitting place for the guest of honor sit, eat cake and take pictures. The guest of honors face will show up better in pictures if the tablecloth is a solid color. Make a fun personal thank you note for party guests by making a handprint thank you card. Buy blank note cards and place a handprint of the one year old on the front. Paint the 1 year olds hand with non toxic paint and press down on the front of a note card. Repeat for as many cards as you need. Let the cards dry and then write a personal note thanking them for the 1st birthday gift inside. 1st Birthday Games - Fun 1st birthday party games especially for the first birthday and younger guests.